So just where are we at after 10 years of the GFC? It would appear that some commentators are split…one stating we are heading for 8 interest rate increases in the next 2 years, and another stating that there would not be a change in 2017. Both statements made within a week of each other and both by former Reserve Bank board members. What the RBA did say recently, the ‘normal’ for interest rates as they see it, is around 3.5% – we are currently sitting at 1.5%, so there is obviously ground to be made up to reach 3.5%. However, no time frame has been put around just when and how often we can expect increases. If the AUD$ goes north of USD$0.80, which appears possible, I would not expect another cut. The only way from here is up, but we may not see the first increase until 2018. Property price crash predictions have now been replaced by more conservative observations that property prices will not crash but slow to small single digit percentage increases year on year. The one thing that most experts are agreeing with, is that within business the conditions we are seeing now and for the past 6-8 months have returned to where they were pre-GFC. This level of business confidence is a great sign of things to come. Couple that with Government infrastructure spending and numerous big and small projects now on the go, especially prevalent in Victoria and NSW…we enter the new Financial Year with renewed vigour and enthusiasm. We would like to welcome Mark Sealy and Ian Sealy on board. They are now trading as Transport & Equipment Finance (Tasmania) in New Town, Hobart. The Sealy boys are well known in Tassie, have extensive knowledge of the logging, forestry and trucking business in the State. We welcome them to the team and wish them all the best. What is the one area that is holding back the economy and preventing real growth. In good times, the private sector is a great place to be employed, it usually outstrips public servant wages, provides greater upside by way of increases and bonuses when times are good. With small business (44%) to medium business (24%) being the largest employers of people in Australia, or 66% of the workforce – private sector wage growth is instrumental in returning the country to prosperity. The 10-year GFC has seen the private sector wages stagnate and perhaps fall in real terms. Whilst we have all enjoyed record low interest rates, when you factor in rises in household expenditure such as gas, electricity, groceries, pretty much all day to day necessities – then the fortnightly earnings and how far they stretch each month has gone backwards. That disposable income, the little extra that used to be available for savings, holidays or just a rainy day, has been eaten up with just getting by. Meeting your everyday living costs. Whilst the current return to pre GFC conditions is encouraging, there is a real need to get some extra funds flowing through the private employment sector to boost wages and the best way to accomplish this is with tax breaks for small and medium size business. A report by the Tax Justice Network – an international group focused on investigating tax avoidance – and the United Voice union says almost a third of companies listed on the ASX 200 pay 10 per cent or less in corporate tax. This is substantially less than the statutory 30 per cent corporate tax rate for large companies. Small and medium business bears the full brunt of the tax burden in this country. Tax relief is needed to free up costs, encourage and grow staff and reward them for their efforts. Tax relief should be available based on the number of employees each business has, not turnover. Small business should be defined as less than 20 staff, medium less than 50 staff, not tied to a company’s annual turnover figure. An immediate company tax rate reduction from 27.5% to 25% in Australia is needed and needed now. There has been an explosion of new lenders hitting the market over the past year or two, and we thought it would be a good time to let you in on a few that we are now using. Below is a montage of some of the new companies vying for your business. Some of these new lenders have peak borrowings, i.e. up to $50,000 maximum lend, per asset. Loan Portfolio Offering Chattel Mortgage, Asset Purchase, Op Lease, etc. Pricing It may not be a cheap as the Banks, but is it fair. Security for the loan What are they seeking, equipment &/or property? Documentation & Terms Is there any hidden ‘gems’ that lock parties in. If we as a company are not satisfied that what is being offered to our clients is reasonable and fair in the current environment, Transport Finance will not deal with these companies. There are plenty of approaches that have been made from new players in the lending space that we have decided not to add to our panel of lenders and simply will not entertain. You can be rest assured that if we add a new lender to our panel of available lenders, we have done so after conducting due diligence on them, we consider their offering fit for our clients’ needs and are confident that, if recommended, will be a good fit for your business. William (Bill) Evans is a graduate of the University of Sydney and the London School of Economics. The Australian dollar has been on a tear since early May, jumping nearly 7% against the US dollar to its highest level since June 2015. It’s been a remarkable run, but one Bill Evans, Westpac’s chief economist, thinks will soon come to an end. He says that the AUD/USD will come under substantial selling pressure next year, offering five reasons why he thinks it’ll end 2018 buying just 65 US cents. over the next two years compared to market expectations of around 0.40%. Despite three rate hikes in December, March and June, the USD Index (DXY) has actually fallen by 2% since prior to the US election in November. DXY is actually down 7% since its peak in December last year as markets have lost confidence in prospects for reform in the US. Markets now seem vulnerable to some upside surprises. While there is no way of assessing markets’ direct expectations for growth in Australia the fact that a 0.25% rate hike is now factored in by August next year implies that markets are expecting a much stronger growth environment in Australia than our view. We continue to expect rates to remain on hold through 2018. Westpac is forecasting that Australian GDP will grow by 2.5% next year, below the 3.25% level currently eyed by the RBA. Our expectation for the short-term yield differential between Australia and the US by end 2018 is minus 0.40% compared to market expectations of plus 0.20%. We consider that, based on historical evidence, Australian rates falling below US rates will have an exponential impact on confidence in the AUD. Consider the only previous examples of AUD short rates falling below US rates. Over the year from July 1997 when the AUD cash rate fell 0.5% below the Federal funds rate the AUD tumbled from USD 0.75 to USD 0.57. In August 1999 when AUD also fell back to 0.5% below US rates the AUD fell from USD 0.67 to USD 0.58. Through 2018 we expect a 26% fall in the bulk commodity Index, including a 30% fall in the iron ore price. That adjustment will be underpinned by a marked slowdown in Chinese industrial demand, as the government resumes its rebalancing policies. 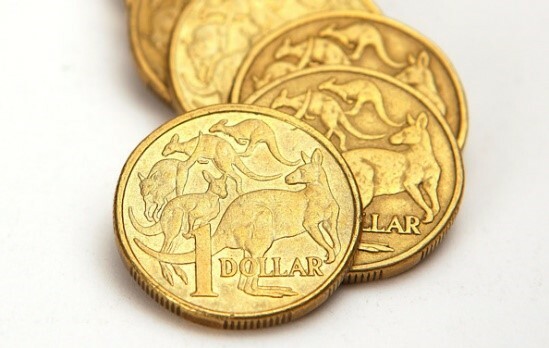 Evans says that he’s not particularly surprised that Aussie dollar is trading around current levels, noting that a significantly weaker profile for the Aussie “is not expected to gather momentum until the first half of 2018”.